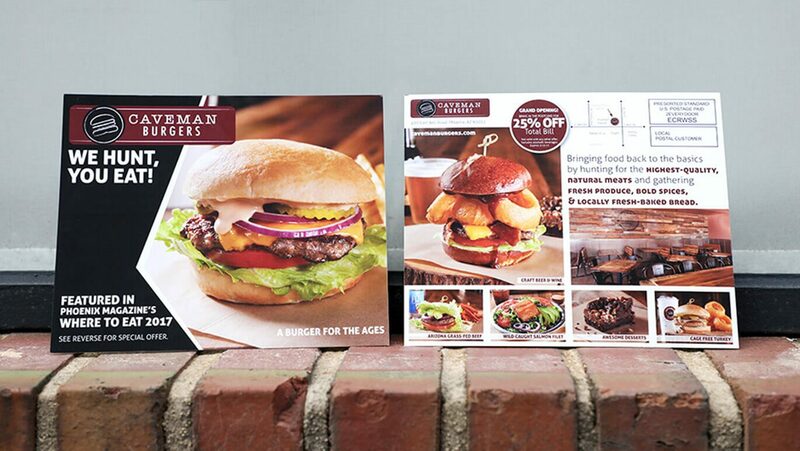 Postcards are a great way to grab attention and promote your business, product or services. Creating a strong marketing piece is key to successfully attracting interest and new customers. It can be challenging to design one. It is important to remember your target audience when creating the design. Make sure you understand the tone and style of a design, as it may attract some and possibly repel others. Finding the right tone and style of your target audience will be most effective. When thinking about the tone of the card, it should match your business to create a coherent whole. Provide the audience with the information you want to pass along; this may include using text, coupons and a call-to-action. By including a CTA, it takes the guessing out allowing recipients to understand their next move. This can ultimately increase customer response. Postcards are available in a variety of sizes to meet your needs; for either a small or large business. Depending on the size selected, it can be challenging to communicate your complete message. Work to maximize the space by using images that complement your text; the imagery and text should together reveal the message. Including hi-res pictures, logos, and bright color all can help add interest and can show what you are trying to communicate. Try to keep the text limited to one or two font types and avoid large blocks of text and light colored text that can be difficult to read. You want to make sure the recipient is able to understand your message, but most importantly, be able to read it. The goal should be to capture the reader’s attention and make them want to find out more. 6″ x 11″ and many more. Keep them clean and simple, without an overload of visuals or text. Use contrasting elements such as light and dark, large and small, and opposite colors to catch attention, but try to keep the elements balanced overall by distributing them relatively evenly in the design. Make sure any colored backgrounds or images fully extend into the bleed area for a professional look. Rounded corners, matte finish, velvet laminated, and other options including Spot UV and Stamped Foil, can give them a unique feel and look making it stand out from competitors. Looking for a free postcard template? We can help! Depending on how they were delivered in the mail, sometimes the back displays first, so consider using that space to grab the attention of your audience. Both sides should work together to attract the reader’s interest and convey your business message. Always proofread your text and review the details before finalizing. They are a great way to attract the interest of your audience; spending time carefully with a postcard design can let you reap the rewards later. If you would like to request a custom design, contact one of our in-house graphic designers. They will be happy to assist with your project. Postcards are ideal for mailing to potential customers. If interested in targeting a specific targeted audience, we offer Print Only and Full-Service EDDM®. You’ll be able to select from USPS® mailing routes or by zip code(s). If you have purchased a mailing list, you can use our Direct Mail service.